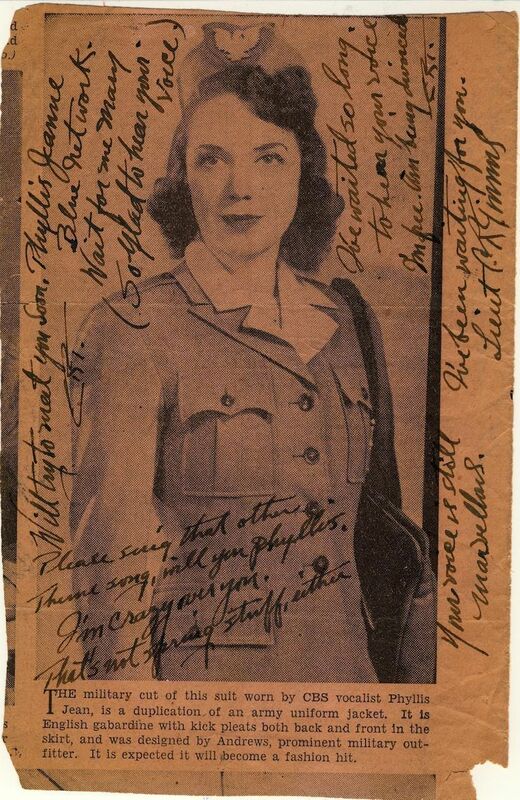 WWII 'Canteen Girl' Kept Troops Company From Afar For 15 minutes each week, Phyllis Jeanne Creore spoke and sang to the servicemen and their loved ones in her NBC radio broadcast. Now 96 years old, the beloved "Canteen Girl" shares her memories — and some personal wartime letters, too. 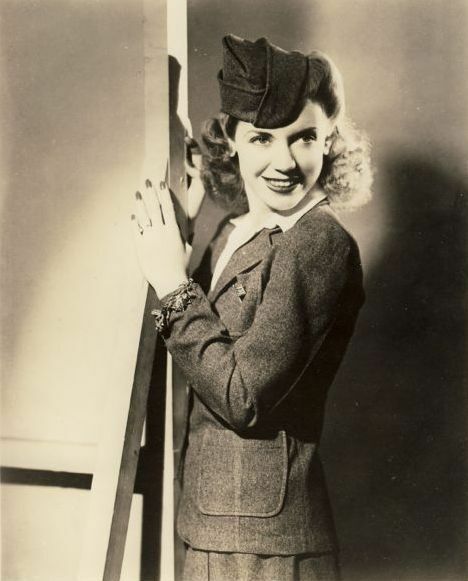 During World War II, "Canteen Girl" Phyllis Jeanne Creore spoke and sang to the troops and their loved ones for 15 minutes every week on NBC radio. American service members have long spent holidays in dangerous places, far from family. These days, home is a video chat or Skype call away. But during World War II, packages, letters and radio programs bridged the lonely gaps. For 15 minutes every week, "Canteen Girl" Phyllis Jeanne Creore spoke and sang to the troops and their loved ones on NBC radio. Her Christmas shows were morale boosters. 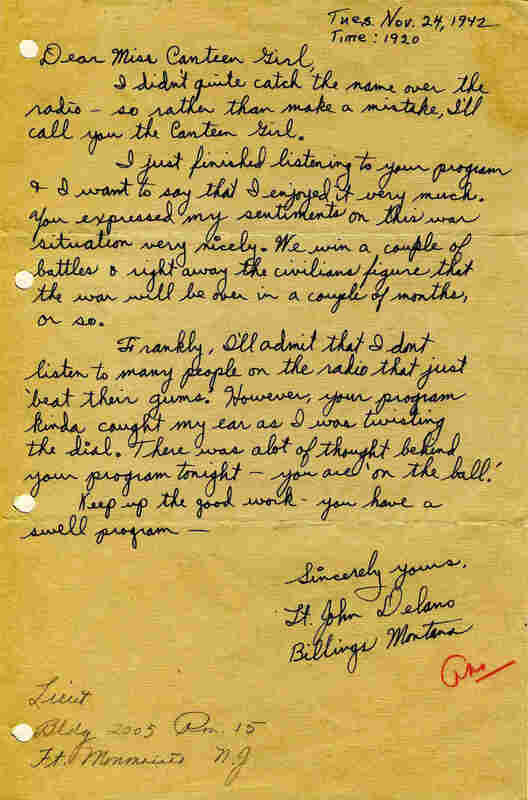 America must "use more sentiment and less tinsel, and that's the way it should be," she told her listeners during one wartime Christmas broadcast. 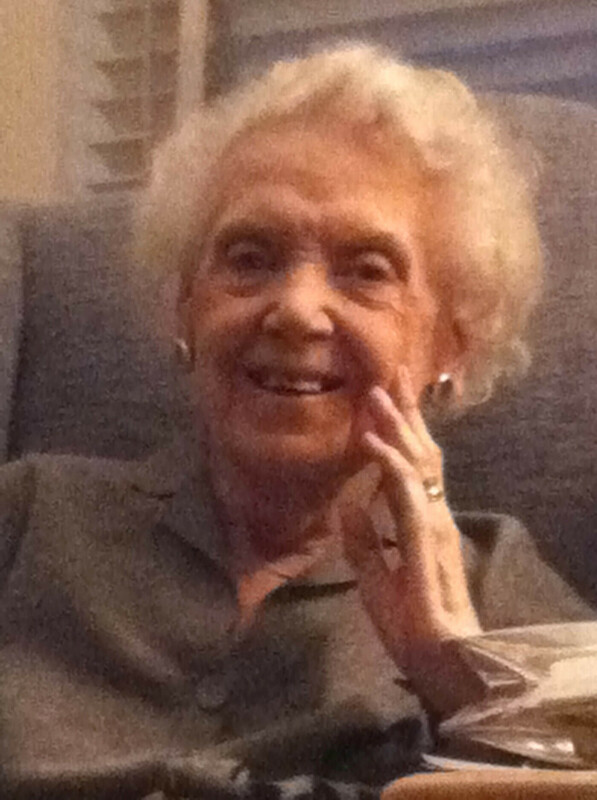 Now 96, Phyllis Jeanne Creore Westerman sits in her apartment on New York's Fifth Avenue, remembering those seasonal broadcasts she recorded 70 years ago. "It was just more poignant because the boys didn't want to go away on Christmas," she says — with traces of that perfect 1940s radio diction. So she did what she could to lift her listeners' spirits. She'd been a volunteer at the New York City Stage Door Canteen; founded by the American Theatre Wing, it was the precursor of today's USO. Stage Door Canteens sprouted up across the country during World War II — places where troops (in New York sometimes 2,000 a night, in shifts!) could drop in for a few hours. The goal, she says, was to provide entertainment, food and comfort to the young troops. "They were all homesick," she says. "Some of them were 17 years old," they were about to deploy, and "they couldn't mention when the ship left or what the name of it was." Famous film and theater actors showed up to help. The 1943 film Stage Door Canteen featured Katharine Hepburn, Helen Hayes, Ray Bolger and many others. 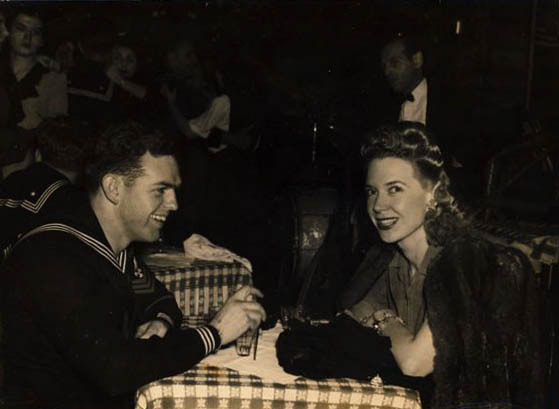 Creore sits with a sailor at the Stage Door Canteen in New York. "They were all homesick," she recalls. At the real New York Stage Door Canteen, young wannabe stars like Creore were regulars. As volunteers, they came to dance and chat. "But it was the stars who did the hard work," she says. "They were cooking, hamburgers and hot dogs, served it at the tables, washed all the dishes. They had big bands that volunteered that we danced to — we weren't supposed to make dates with 'em, but I don't think everybody complied." Creore came to the big city in the 1930s from Rochester, N.Y., hoping, like so many young and talented people, to find work as an entertainer. She headed for The Rehearsal Club — a boarding house founded in 1913 — that provided affordable rooms for young, single women with big dreams. "And that's where I lived," she says. "Forty-odd young ladies from all over the country who wanted to be an actress [or] singer — a lot of Rockettes." Blond, blue-eyed, with carefully polished nails, pretty Phyllis Jeanne settled right in. "I lived there when the war started," she recalls. "I heard in my little room Roosevelt come on the radio and say war was declared, and from then on, it was chaotic." Phyllis Jeanne Creore Westerman is now 96 years old. She lives in an apartment on Fifth Avenue in New York City. In wartime New York, Creore handed her food ration books over to the Rehearsal Club cook, so there would be enough sugar and butter for all the girls. She did a bit of radio work, found singing jobs with various bands at hotels like the Biltmore, and volunteered at the Stage Door Canteen. That's where she got the idea for a regular radio show — to reach more troops — across the U.S., and in Europe by short wave. "I took the idea to NBC and they OK'd it," she says. "And I got a pianist, and eventually they gave me a writer." The program began in 1942. She took requests and dedicated the lilting, lovely songs of the day to soldiers. Mail poured in to Canteen Girl from all over the country. She keeps some in a big leather scrapbook in her apartment. 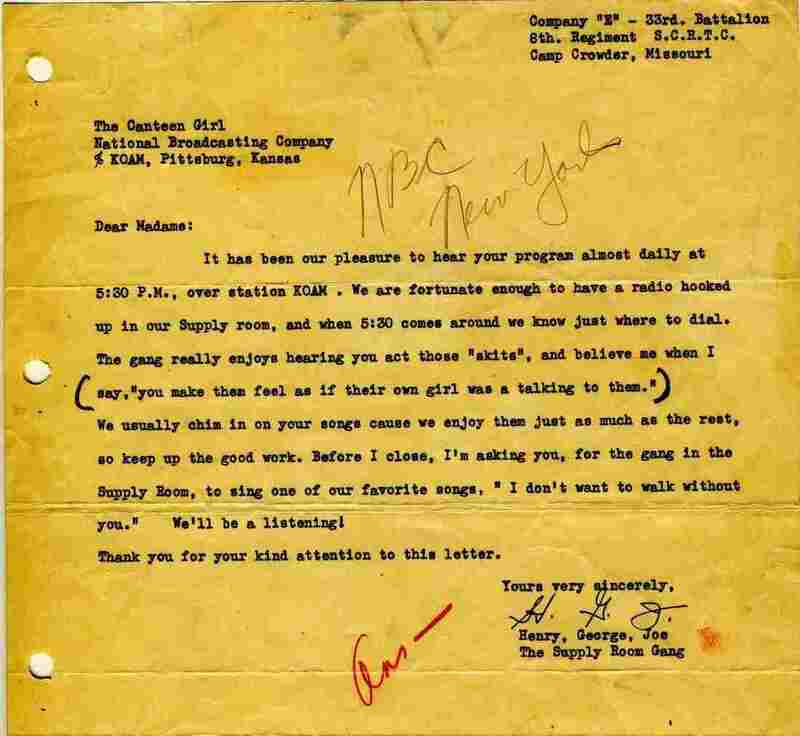 They were corporals in Missouri, a sailor in New York, all thanking her for cheering them up. 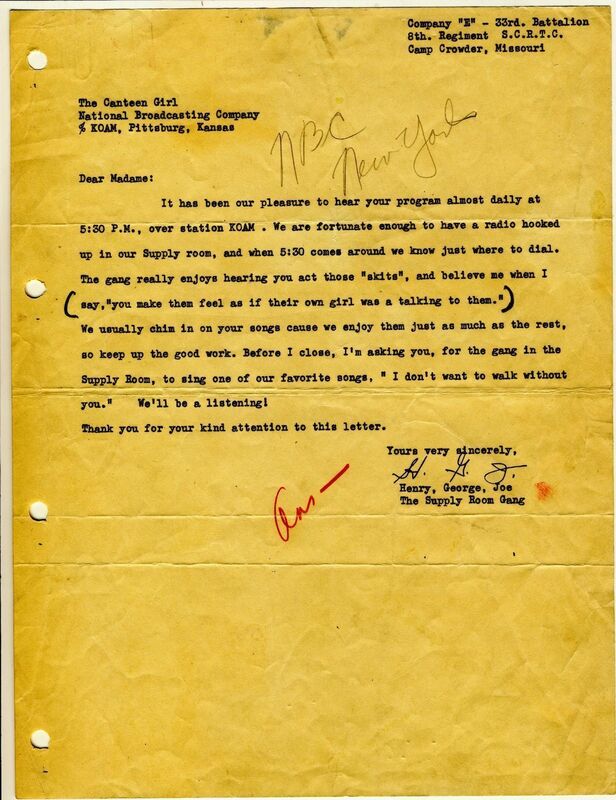 (You can see some of those letters at the bottom of this page.) 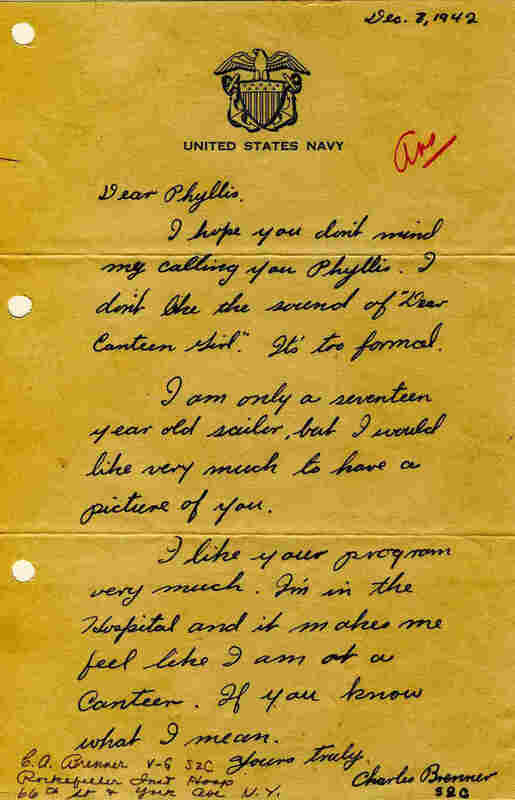 Today, the treasured handwritten wartime letters are fraying around the edges, but Phyllis Jeanne Creore Westerman's memories are keen. At age 96 — no eyeglasses, no hearing aids — she's gotten rediscovered. 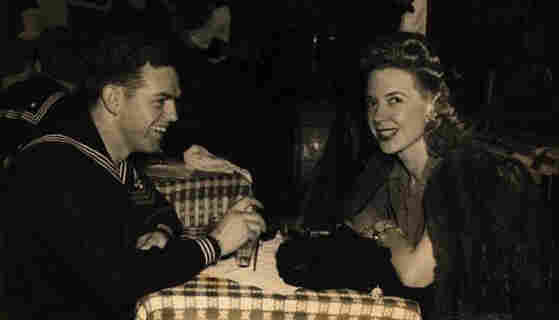 A short film about her is part of the New York Historical Society's current exhibition on the city during World War II. NPR came calling. And a few weeks ago, at her apartment's holiday party, as the building's oldest resident, Westerman was offered a throne on which to sit — in honor of her newfound celebrity from the old radio days.